After his first 150 days in office, President Trump DESTROYS Obama in every single meaningful measurement! We’re not surprised even a little bit. We elected a warrior because we needed a change and that’s exactly what we got. The MSM assault him a daily, act out stabbing him on stage and do so many other disgusting things against our President, and in spite of it all, he just keeps working for the American people. 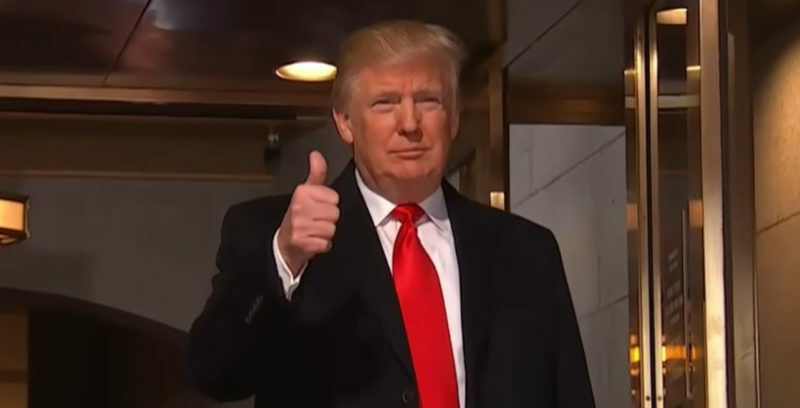 TGP by Joe Hoft: On Monday it will be 150 days into President Trump’s first term and on Tuesday it will be five months since President Trump’s Inauguration on January 20th. The mainstream media (MSM) and Democrat Party will not report it but when compared to President Obama’s first five months, President Trump’s economy is just plain on fire! President Trump is Right and the Numbers Prove it – Especially when compared to President Obama during the same time period. 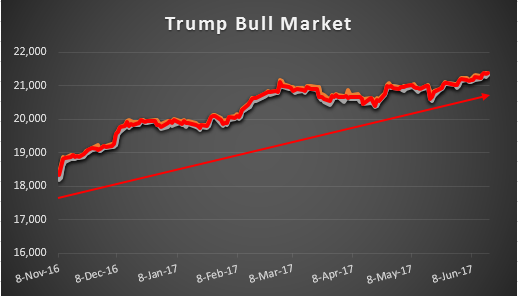 In President Trump’s first few months since the election and since his inauguration the US Stock Markets are at record highs and millions of Americans are benefitting in their retirement savings accounts. * The DOW daily closing stock market average has risen 17% since the election on November 8th. (On November 9th the DOW closed at 18,332 – on June 16th the DOW closed at 21,384 for another all time record closing high). How does this compare with President Obama’s first few months? 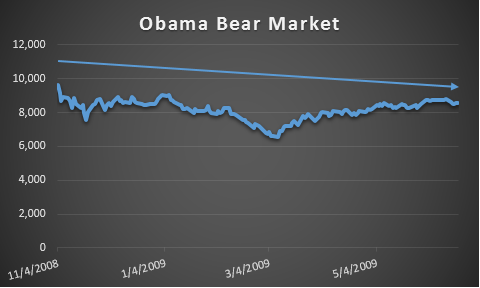 The stock markets under President Obama moved in the exact opposite direction in the seven months after President Obama’s election win in November 2008. * The DOW daily closing stock market average tanked (went down) (-11%) between Obama’s election win on November 4th, 2008 and June 19th, 2009. (On November 4th the DOW closed at 9,625 – on May 20th the DOW closed at 8,539. Overall it decreased more than 1,000 points). This is the opposite direction of President Trump’s rally. As of today, President Trump decreased the US Debt since his inauguration by (-$101) Billion. President Obama on the other hand increased the US debt in his first five months by $771 Billion. Obama increased the US debt in his first 5 months by $872 billion more than President Trump or by nearly a trillion dollars more! 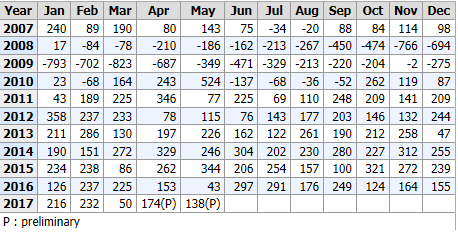 Also according to the Bureau of Labor Statistics President Trump decreased unemployment every month since his inauguration (January through May 2017.) The unemployment rate in January 2017 was 4.8% and by May it was down to 4.3%. President Obama on the other hand again moved in the opposite direction. 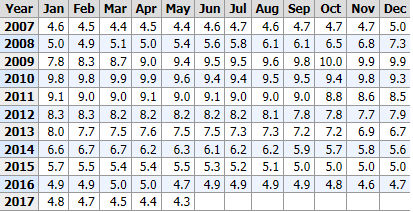 In his first five months as President the US unemployment rate increased each month from 7.8% in January 2009 to 9.4% by May of 2009. The US Manufacturing Index soared to a 33 year high in February 2017 shortly after President Trump was sworn into office. The index reached 43 in February which was the best outlook since 1983 under President Reagan. In Obama’s first five months in office (January through May of 2009) the best manufacturing index activity rating was a negative -22. The difference here is greater than 50% with Obama again in the wrong direction. The Federal Reserve has increased interest rates three times since President Trump was elected into office in November. The Fed increased intereste rates only once in Obama’s 8 Years prior to the increase in December. No Fed Funds Rate increases took place between June 2006 and December 2015. CNBC reported in December 2015 that President Obama oversaw “seven years of the most accommodative monetary policy in U.S. history” (from the Fed). But still the Obama economy due to numerous job killing initiatives pales when compared to President Trump’s. Illegal immigration is down 67% since President Trump’s Inauguration. President Obama opened up the US borders and Trump has drastically shut down illegal immigration. The result of this is lower costs for the federal government and taxpayers. American drivers are poised to reap unexpected savings at the gas pump after oil prices kicked into reverse. The low gas prices that benefit Americans are due in part to President Trump’s actions to allow drilling in the US, reducing the amount of foreign oil imported from Middle East nations. Under President Obama gas prices in the US reached nearly $4 a gallon. President Trump’s actions are yet to be seen but if output rises as expected in the US, the price of gas will remain low or decrease. One of the first things that President Trump did in office was to reduce the number or burdensome regulations put in place during the Obama era. In January President Trump signed his 2 for 1 executive order mandating that for every new regulation, two regulations needed to be revoked. Even far left Politico notes that significant federal regulations since Trump’s inauguration have slowed to an almost total halt. The mainstream liberal media won’t report this, but when looking at the economy, President Trump the businessman crushes the former community organizer Barack Obama in every meaningful measurement.